Want to watch satellite TV on your computer, or use your computer to record TV shows? We explain the process of setting up your PC to watch and record satellite TV. 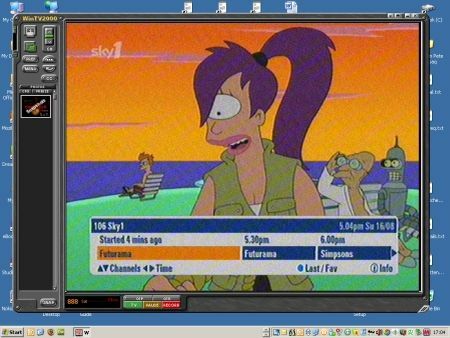 If you’re looking to watch satellite TV on your PC, the easiest option is to connect an output from your satellite TV box into a TV receiver on a PC. These small boxes plug into your PC or laptop’s USB port, and let you watch TV via a TV aerial connector. To be able to watch satellite TV on a PC, you need a TV adapter that supports analogue (some only support digital). The best bet is to get a TV adapter that supports both analogue and digital. These are called “Hybrid” receivers. Once you have a PC TV receiver, you need a way of connecting the output of your satellite receiver, to the input of your PC TV receiver. Most satellite TV receivers have a standard TV aerial output – This may be labeled “RF Out” or “TV out”, and looks like it will connect to a standard TV aerial lead (pictured to the right). No TV aerial output, or no modulated output? If your satellite receiver doesn’t have an RF modulated output, then all is not lost, as you can use an “RF Modulator”, which converts SCART signals to a modulated TV aerial signal. Connect a SCART lead from your satellite TV box in one end, and an aerial lead into the other, and all should be well. Recommended: The Universal RF Modulator (Code VH89W) from Maplin Electronics. Also, one from TVcables. If you’re following along so far, you should now be in a position to connect the output of your satellite TV receiver to the input of your USB TV Receiver adapter. You will need a co-ax TV aerial lead for this. You can get TV cable extension leads, kits and connectors from Maplin Electronics. 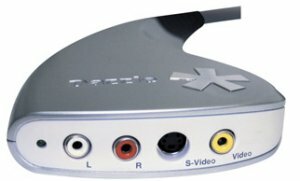 NOTE: If connecting from a Sky Digibox, you will need a Male-to-female aerial lead – The USB adapter has a female aerial socket, and the Sky Digibox has a male aerial connector. Once connected, you then need to get the PC to tune in to the satellite TV output. The USB TV Adapter will come with special TV software to allow you to tune in to TV signals. Install this, then scan for TV channels. The satellite receiver will be connecting as an “analogue” TV channel. If all is well, you’ll now be able to watch satellite TV on your PC. Can’t tune in to your Sky box? It could be that the modulated output on your Sky box is turned off. On your Sky box, press ‘Services’ on the Sky remote, then type 4 0 1 and press ‘Select’ (HD boxes: Services > 0 0 1 > Select). Then, select “RF outlets” and change the RF channel number to a number of your choosing (between 21 and 68). For slightly better quality, and more flexibility, you could get a dedicated satellite receiver for your PC. These allow direct connection to a satellite dish, and effectively replace the set-top box receiver. You’ll need to have a cable connected directly from the dish to the PC TV receiver. 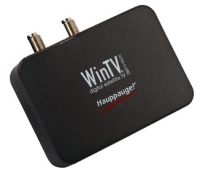 We’ve found the Hauppauge Win TV-NOVA-S-USB2 receiver at DABs.com and Maplin.co.uk, which will do the job. With the NOVA-S, pictured to the right, you can plug one end into a PC, and the other end to your dish, and use the supplied software to access the free-to-view satellite TV channels. You won’t be able to get the subscription channels, as you won’t be able to plug in a Sky subscription card. Alternatives: at DVB-S Satellite PCI TV Card (which fits inside your PC’s case) or WinTV Nova S2 PCI card. Sky Digital: A range of Sky’s TV channels are available to view online using Sky’s Sky Player – more on our Sky Go page. Catch-up TV? Missed a BBC, ITV, Channel 4 or Channel 5 show in the last 7 days? Watch online for free. See our Catch-up TV page for more. Movies and videos on demand? – Check out Blinkbox. TV from other countries – Try Jump TV. The TV receiver cards mentioned above will allow you to record from a satellite TV box via the co-ax aerial socket, but if you’re looking to record in slightly higher quality, you’ll need to go from the SCART socket not the satellite box aerial socket. Get a USB device that lets you capture “composite video”. You can pick up a Dazzle USB device for your PC from Maplin.co.uk or Dabs.com. Can I watch a different channel on my PC? If you’re looking to watch different Sky channels in a different room of a property with an existing installation, you need to take out “Sky Multiroom” with Sky Digital . An engineer visits to run a new cable from the dish LNB to your required room – they normally supply a set-top box as part of this installation. You could then connect the output of the box to a standard analogue PC PCI card input. If you want to do this without a box, then there are a couple of Digital Satellite receivers for the PC, however note that if you’re looking for subscription channels, you’ll need a subscription card from Sky, and a PC receiver with a CI interface to accept the card – we don’t know of any PCI cards that support a CI interface. For more advice, try our Tech forum. I want to WATCH all channel in my PC through cable device , it could be possible to me, please let me know the procedure to by from pakistan . The model of Hauppauge you’ve mentioned is almost impossible to get hold of. Could you recommend an alternative, e.g. would the WinTV ministick do the do the job or is that too basic and you need something like the WinTV-T Video Edition? It is possible with tv tuner. Some tv tuners has ability to record the movie on your HDD. Thank You for this Post.